Where will reactions take place and where is heat being released? What is the distribution of temperature and chemical species? What is the heat flux to walls, refractories, boiler tubes and other critical structures? What are the exit concentrations of pollutants such as NOx, SOx and soot? This knowledge allows us to implement intelligent modifications of the combustion system via simple procedures, such as air stagging or urea addition, with the aim of reducing pollutant formation. What modifications are required to a plant to change fuel, such as moving from burning pulverised coal to a mixture of coal, wood chips, organic waste, biomass or shredded paper? Does the change in fuel require a change in where/how fuel is injected? What is the impact on the changed operation mode on the temperature distribution? Will a newly designed burner be stable or will it be subject to flashback? What will be the metal temperatures? To answer these and many more questions requires sophisticated state of the art CFD software. Both ANSYS FLUENT and ANSYS CFX are well equipped to model combustion processes, having not only the necessary combustion models but all of the ancillary infrastructure that is needed. 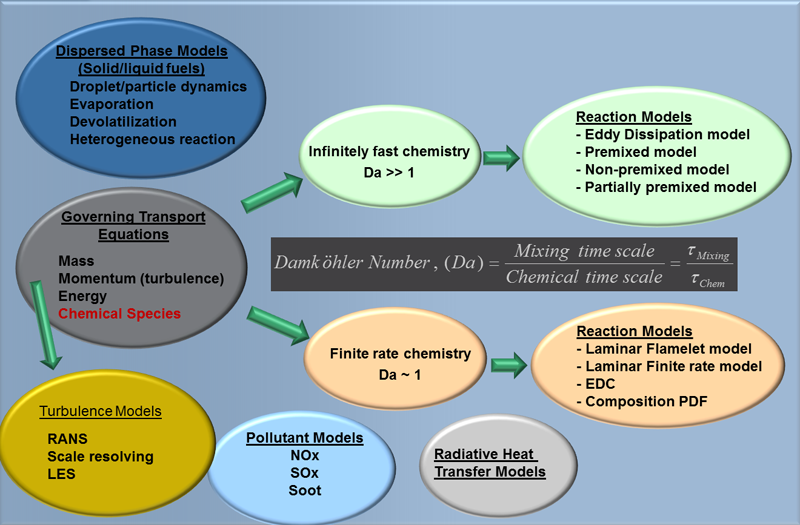 The schematic below shows a schematic of the combustion modelling process. Essentially the conservation equations for mass, momentum, energy and chemical species are solved to provide local values of all of these quantities. High fidelity models for turbulence, thermal radiation and heat transfer are a requirement to produce accurate and reliable results. If solid or liquid fuels are present, then additional multiphase models are also needed to track the fuel particle /droplets and their history as they undergo the various stages of combustion. The configuration of the fuel and oxidiser. If they are mixed, then we have what is known as “premixed” combustion. If they are separate and the flame is located at the region where they mix, it is known as a “diffusion flame”. If some combination of both situations occurs, it is known as “partially premixed” combustion. Although combustion is a chemical process it may not always be the reaction rate that determines how fast a fuel burns. 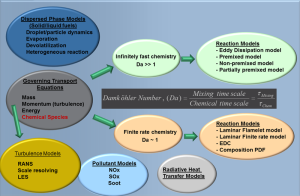 The ratio of the mixing timescale to a combustion timescale, known as the Damköhler number, determines the controlling physics. For large Damköhler numbers, it is the mixing of the reactants in a diffusion flame or transport of products in premixed combustion that determine the rate of consumption of the fuel. In all other situations the chemical reaction rate plays a role and finite rate chemistry models are needed. Once the above information is known, the next step is to decide the level of sophistication of the chemical kinetics to be used if finite rate chemistry is to be considered. Even a simple fuel, such as methane, requires a mechanism containing many tens of species and hundreds of reactions for a fundamental description. The decision has to be made if this level of sophistication is really needed or whether some form of reduced mechanism (containing only the most important reactions) or a single or several global mechanisms can be used (which rely on curves fitted to experimental data rather than being based on fundamental kinetics). This choice again affects which model is to be used and the computational resources that are required. If pollutant formation is important, then a more sophisticated approach is needed than just to model heat release. The recent acquisition of Reaction Design by ANSYS means that the CHEMKIN suite of tools is now part of the ANSYS offering on combustion. 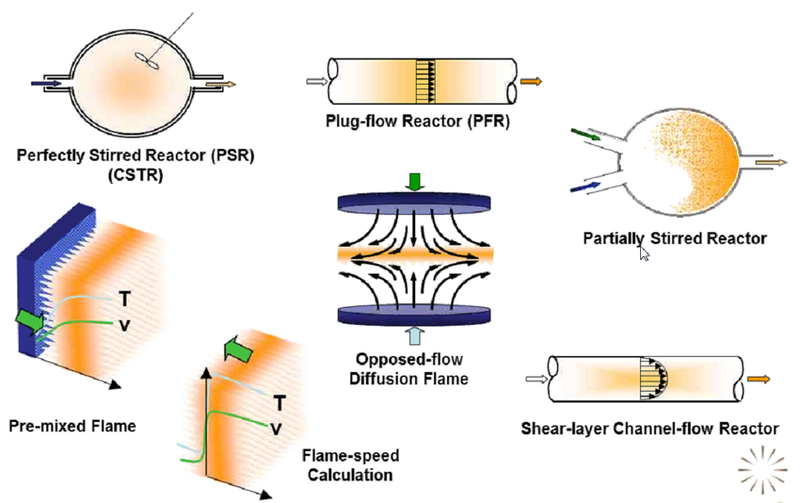 CHEMKIN-PRO is used widely to develop chemical mechanisms and rapidly determine reaction behaviour in simple reactors (as shown in the figure below), such as perfectly stirred or plug flow geometries. 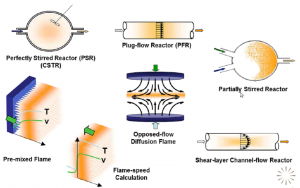 There are also sophisticated tools in the Reaction Design suite to allow mechanism reduction and construction of reactor networks. There is also a coupling between ANSYS FLUENT and CHEMKIN that allows the stiff chemistry solver of CHEMKIN to be used by ANSYS Fluent. 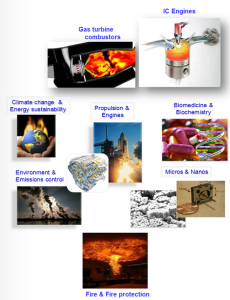 In advance of the visit to Australia in November 2014 by combustion expert Pravin Nakod from ANSYS Inc., LEAP invites you to join us for a webinar on Oct 30th to learn from Pravin Nakod and Prof. David Fletcher about how ANSYS CFD simulation tools are being applied worldwide to solve such complex design challenges posed by combustion systems. Please click here to register for this webinar. Following the webinar, LEAP will be hosting a series of best-practice seminars/training sessions (at no cost) to provide engineers with more detailed information on key aspects of the combustion modelling process and provide further guidance on appropriate CFD model choices. These seminars will run from Nov 17-21 in Brisbane, Sydney, Melbourne, Adelaide and Perth. Please click here to register your interest in attending these seminars and LEAP will be in touch once the venues are confirmed.